Have you ever played marbles? Have you ever spilled marbles on a table and watched them quickly roll outward in all directions? Have you ever tried to juggle marbles? Lately, my life has felt like one continuous attempt to juggle marbles. Big marbles. Little marbles. Super smooth and slippery marbles. So many it feels like I can’t even count them. It’s been a frustrating mess. How did I end up with all of these things to juggle any how? You should know that I personally struggle to juggle two tennis balls. I just move a bit slower than the balls do. Juggling is not a talent that I have been blessed with. Juggling marbles seems ridiculously out of the question. Much of it is probably my own doing. I said yes once. Then I said yes again. And again. And again. And again. Each yes, picking up a marble to juggle. That looks like a good idea. That seems like a great way to use my gifts and talents, I can do that. Oh, I didn’t realize that was coupled with those two things. I suppose if I did that before, I should do it again. Oh, I never knew that belonged there, so here’s another. Someone assumed I could handle one more so they threw another my way. All these pretty marbles. Well, they are not so pretty when they are dropped, spilling all over and rolling away frantically in different directions. 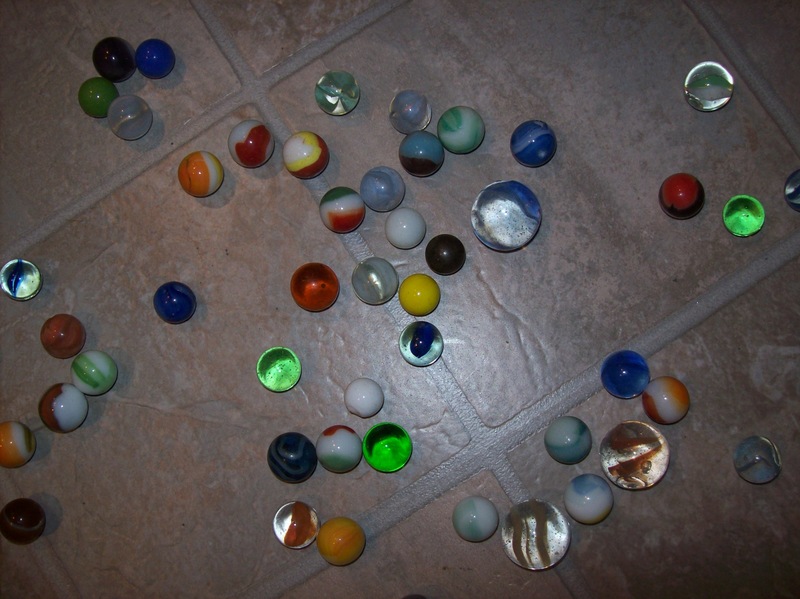 Take a cup of marbles once and spill them on the tile floor, then you will know exactly what I am talking about. To me, it seems lately that each responsibility in my life is a different marble. I’ve got a lot of marbles. I have no hope of juggling them all in the air. So again, and again, I chase them around to collect them. Often times find that I missed one somewhere. Perhaps the corner behind the desk. Tonight, I sit here and look at my bowl of marbles. I’m not juggling them. I’m not chasing them. But, I don’t know what to do with them. Here we sit. Me and my marbles. Do I walk away from them? Do I throw them away? Do I take them out into the grove and bury them? Do I just leave them on my desk, crawl into my bed and take refuge under the covers while I sleep? I feel like I am going crazy, but I certainly have not “lost my marbles”. They are still with me, so Lord, what do I do? Perhaps I don’t have to do anything with all of my marbles. I don’t have to walk away from them (or run from them). I don’t have to throw them away. I don’t have to bury them. I don’t have to try to escape them hiding under my covers. Maybe it is more about what I need to pick up instead of my marbles. 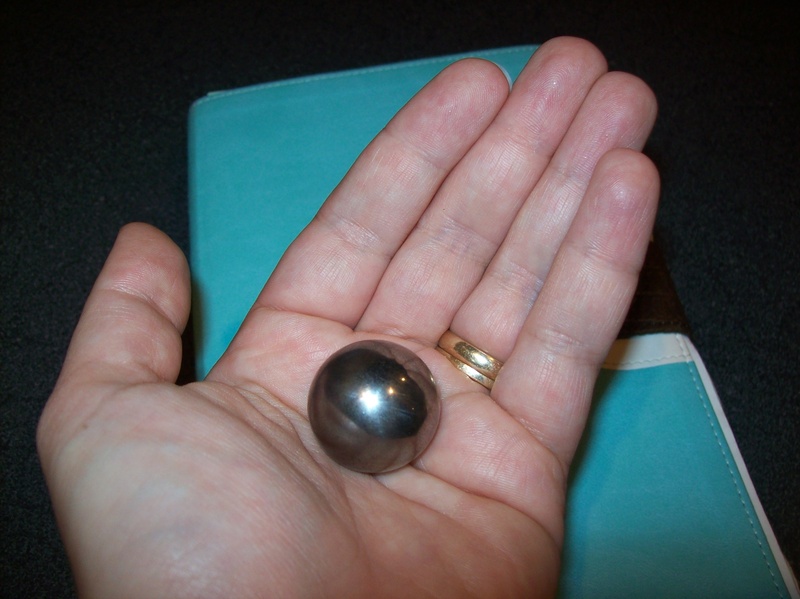 Perhaps I just need to hold onto my precious little ball from a ball bearing for a while. Yes, I said my ball from a ball bearing. Now you may think I have lost more than my marbles. A little back story on this ball, it was a gift from my husband. My husband is a mechanic. He gave this to me way back when we first started dating. Who knows what it actually came from. He thought it was neat and he thought I was neat, so he gave it to me. For nearly 17 years now it has had a special place in my jewelry box. It is a treasure to me from our relationship. It’s plain and simple, just like us. There’s really nothing out of the ordinary about this. It’s not flashy or well colored. There are certainly many marbles in my collection much prettier than this. But I like to hold this ball in my hand. I like to roll it around. I like to smile as I remember all of the silly little sweet things that make up the sacred history of our relationship. I am no mechanic, but here’s what I know about ball bearings. A ball bearing is two rings. One ring is bigger and one ring is smaller. The balls, like my silver one, roll in between the rings. The main purpose of a ball bearing is to help reduce friction and help smooth rotation between the part of the machine that is stationary and the part that is rotating. If that makes no sense I apologize. I’m not the mechanic, my husband is. There are two phrases that stick out to me, smooth rotation and reduce friction. Yes, I could use a giant ball bearing in my life. One that smooths the rotation of the day as I spin around it and one that would reduce the friction that wears on me day after day. As I hold my ball in my hand tonight, I think about Jesus. I bet Jesus would be able to explain a ball bearing much better than I can. I bet He would have just the right parable to going with the ball bearing, one that would touch the heart of mechanics and non-mechanics alike. Jesus is so amazing that way. There would probably even be a great connection about smoothing rotation and reducing friction in our own lives. I wish I could come up with something like that for all of us tonight, but I’m just not that good. Right now I’m so weary. I just want to go climb into bed. But there is laundry to do. A daughter who will need to be tucked into bed soon. A son who will come home from the high school volleyball game and need yet another sandwich. There is outstanding work for me to do in all of my volunteer roles. But I so desperately wanted to write, because I could use some encouragement. I have painfully agonized over these words that are barely making sense to me. You may read through this craziness and decide never again to read a post of my blog. But I’m laying it out there and taking the chance that someone else can relate to my chaos. Perhaps someone else feels like they are trying to juggle marbles in their life. If so, I want you to know that you are not alone. I’m right there with you. I can’t take away your marbles or give you five quick steps to help you improve your juggling skills. I wish I could send you the ball from a ball bearing so that you could hold it in your hand and play with it. When juggling so many responsibilities it is easy to forget to play every now and then. Here is what I can do, I can offer you a word and a prayer. Proverbs 12:25 (NIV) says, “Anxiety weighs down the heart, but a kind word cheers it up.” Attempting to juggle marbles is a surefire way to weigh down your heart with anxiety. But perhaps I could offer a kind word to bring a bit of cheer to your heart. My dear reader, you are so deeply loved. You are cherished. You are treasured. You are delighted in. I think you are phenomenally fabulous and I am so very grateful for your willingness to read what I write. But I have nothing on the way the Lord loves you. If right now you dropped every marble that you are attempting to juggle and each of them shatters into hundreds of pieces, God would love you just the same. God’s love, His passion and His joy for you never changes. You can juggle three hundred marbles, behind your back, blind folded, riding a unicycle and God would love you the same. All of that would not earn you an additional ounce of love from Him. It’s already yours to receive. We do not have to earn any of it at all. We’ve already got it. It is ours. God calls us to Him as His own children, “See what great love the Father has lavished on us, that we should be called children of God.” 1 John 3:1 (NIV). Great love. Lavished on us. Bountiful, fulsome, abundant, generous, copious amounts of love. All for you. All because you belong to Him. No minimum marble juggling requirements. Just be you. Just come to Him. Allow Him to love you in His perfect and pure love. If that doesn’t reduce friction and smooth the rotation our our lives, I don’t know what will. Thank you so much for loving us always, just as we are. Lord, it makes no sense that we can struggle with all we try to juggle, we can drop it all and You still love us ever so much. Lord, You are so amazing. Lord, please help us to hold on to You. When things are feeling crazy and out of sorts, when things are going well. Help us to seek You in all circumstances. Slow us down when we feel like we are spinning. Help us reduce the friction in our lives that wears us down. May we remember, hold to, meditate on and share the truths that You give us in the scriptures. May it nourish us and fuel us for whatever may lie ahead in our paths.